Jose Mourinho has had another dig at Arsenal and Liverpool, suggesting they are not at clubs big enough to make a signing like Manchester United’s capture of Paul Pogba. Last Friday United manager Mourinho branded his Arsenal counterpart Arsene Wenger and Liverpool boss Jurgen Klopp “not ethical” after they questioned the fee the Red Devils were reportedly set to splash out on bringing midfielder Pogba back from Juventus. And following United’s announcement in the early hours of Tuesday morning that the Pogba deal was officially done, Mourinho told MUTV: “I know the discussion, I understand that, sometimes in football, things happen and the club breaks the record, but this is only possible at clubs like Man United. While Mourinho feels the “unbelievable” Pogba “has everything”, he has stressed it may take time before the 23-year-old France international is fully firing in the United side and has vowed to “protect” him if needed. “He’s a very young player, an unbelievable midfield player with such physicality but, at the same time, such agility, co-ordination, skill. He has everything,” the Portuguese said. “What he has to learn now is how to play with us because I always say that in football you can be a super player, like he is, but a team is a team and you need to learn how to play in the team, and the team needs to learn how to play with you. “We need to get the best out of him and this will be a process. So if he needs protection, I am here to protect. 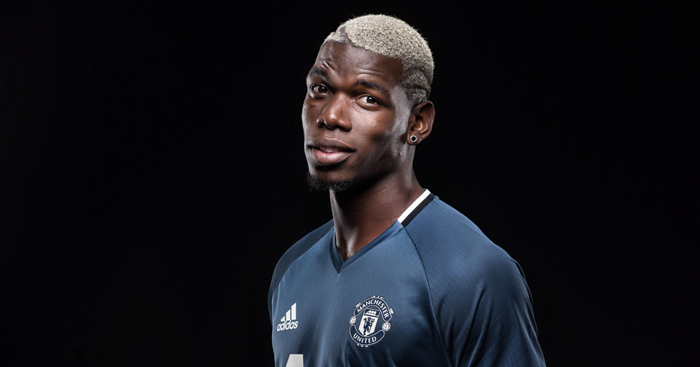 Four years on from leaving for Juve, Pogba has returned to United as one of the biggest stars in the game. Asked if the player seemed happy to be back in Manchester, Mourinho replied: “I can feel that when I speak with him for the first time. I’m feeling now when I see him at the training ground with people he knows since he was a kid. He doesn’t look like a star. “He looks like a kid who is back to his old school and is finding people that he cares about and people that love him a lot. Mourinho – who has also signed Zlatan Ibrahimovic, Henrikh Mkhitarayan and Eric Bailly following his appointment as boss in May as he looks to revive United – added that he is “really happy” with his squad. “It’s the first time I’ve worked with such a number of players because I’m used to working with 20 plus the keepers, and we have in the squad 23 plus the keepers – and even so we had to make decisions and let some players go on loan, and try to sell others,” said Mourinho. “But this group of 23 is a great group and I think in this moment – and I told them this – there is a little bit of frustration for the ones that I have not selected. “They work hard to be in the match and they aren’t, and this is going to happen in the next two or three weeks because we have just one Premier League match. Mourinho is set to let midfielder Bastian Schweinsteiger leave as well as a group of other players also not involved in Sunday’s Community Shield win over Leicester.